This is the place to share your miscellaneous blogs. These are blogs you have that didn’t fit into a previously mentioned category. Leave a comment with a link to your blog. You can also leave a short summary of what your blog is all about if desired. I will move your link and info up into the main body of this post. If I get enough blogs here that fit into a category of its own, I will add that category next year! I have a random/everything blog over at www.bushelandpecks.blogspot.com. And I can’t tell you how happy I am to see you do this. I have an everything/nothing blog at http://peachyringsaredead.blogspot.com ! Thanks for doing this! I kind of combine my photography and family blog all in one, so I guess it fits in this category. I blog about adventures at home and away with kids. Enjoy! I have a family blog. I have 18 month old twin girls and LOVE baby wise! Iguess my blog (a new song) is just a personal blog – whatever comes to me, I share! Hopefully you will be challenged by some posts, find random good deals I’ll share, and on Mondays I hope to encourage you with the what songs are inspiring me. Thanks for stopping by! I started blogging last year…I post several times a month (goal = once a week) on anything that comes to mind. I’m a wife, a stay at home mom of 4 kiddos, and my blog is a place to blab about my ups and downs. i started as a pregnancy blog, moved into a baby/mommy blog. now i talk about a little bit of everything- baby, cooking, fashion, etc. My blog is about being a mom, a wife, and a homemaker! If you need to tell someone, I’m here to listen. I talk about my journey to finding equipoise- a state of balance- in life, love, motherhood and creativity. My blog is a random family events, milestones, faith, rant-type place. I have a savings blog called $aving a Billian. Hope that qualifies! Have been following your blog for months as we learn and use the babywise principles with our 10 month old! I blog about motherhood, babies, life, my music, and anything else I can think of. It’s a mix of everything so I hope you’ll visit! My blog is also about motherhood, homemaking, and being a Christian wife. I often write about cloth diapering, breastfeeding, baby-led weaning, and general motherhood issues. My second child was born with a rare lung defect, so I often write about issues related to that, or about dealing with his food allergies. Our third baby is due next week!! Mine is a combo family blog and outlet for my graphic design and other artwork. There are some miscellaneous posts in there, too.. like anything that has to do with food. 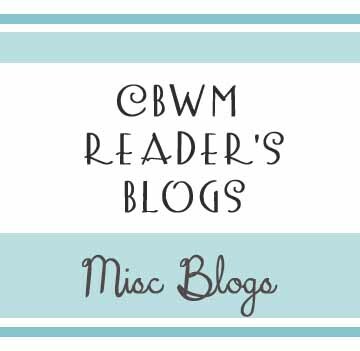 I have a book blog. I’ve been a librarian, teacher, and mom. I read a lot, and have a lot of opinions/thoughts about books. My blog is about our Air Force life, and now our new journey of having twins. It’s a little bit of everything! Hi! I’m Stephanie and I have two blogs, The Loudmouth Lifestyle and Baby Loudmouth. I have been blogging at The Loudmouth Lifestyle for nearly four years about self-help, self-love and inspiration. I post blog tips, life advice and motivation for following your dreams! Hope to see you there! I have a marriage blog where I post interviews, advice, and lessons my husband Ben and I have learned about marriage.